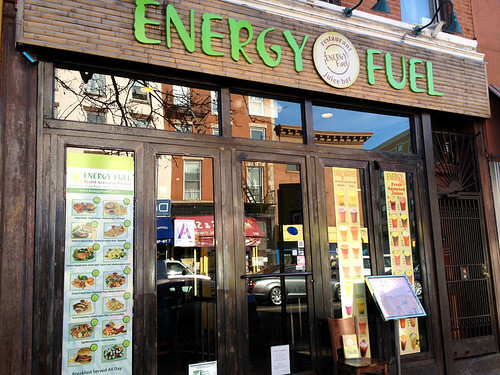 Energy Fuel bills itself as a restaurant and juice bar – with a ton of different mostly-healthy sandwich, salad, and wrap options, including many more vegetarian choices aside from the burger. 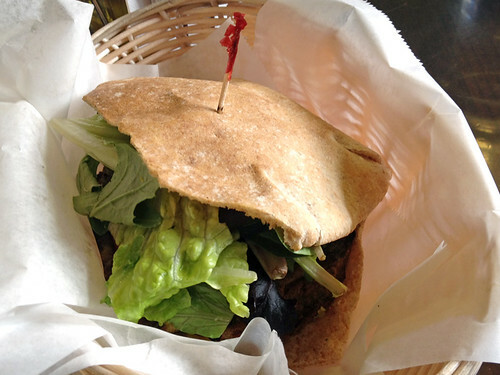 The burger arrived inside a whole-wheat pita. I guess because that’s healthier than a bun? 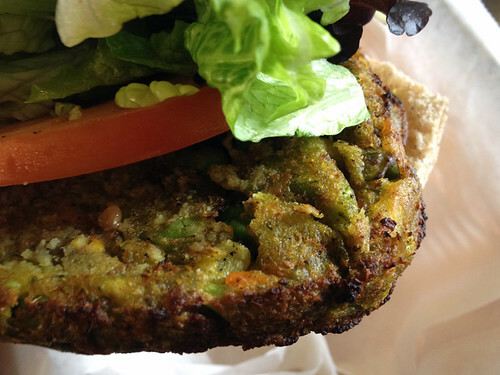 I don’t mind a burger inside a pita (example, Sparrow Tavern’s excellent veggie burger! ), but it’s usually not my first choice just because when I am craving a burger I am usually imagining one with a bun. The greens were very fresh, and the tomato slice was nice and juicy. The slices of cucumber mixed in were a nice surprise, something I don’t often see in burgers. But I really wish there was some kind of dressing or sauce! It just needed that extra kick of moisture and flavor. The patty was some kind of average pre-made mash of carrots, corn, and soy beans. It was served steaming hot, and it did fill me up for the rest of the day, but its flavor was not particularly memorable. I asked the restaurant staff if it was vegan, and they seemed confident in saying that yes, it was. I would probably return here to try a juice or smoothie (they had so many different options, including smoothies made with soy milk instead of dairy! ), or a different sandwich on the menu, but if I really want a burger I’ll go someplace that serves a more exciting one. Bummer. Can't get behind a pita-ed burger anyway, never mind dry. 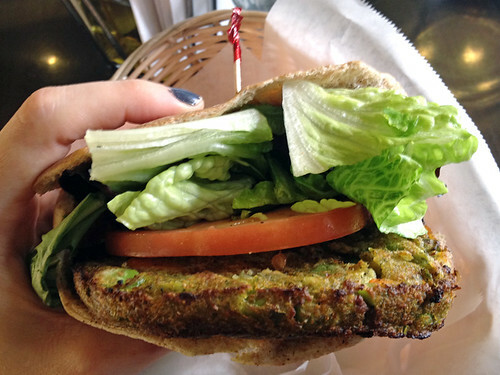 Instead of any bun at all, I order the veggie burger in a plate with lentils and either spinach, sweet potato or hummus! That is my favorite meal!